KINGMAN – Middle School National Junior Honor Society’s “Penny War” for WAHS. Kingman Middle School National Junior Honor Society students with nearly $200 in pennies donated during the ‘Penny War’. 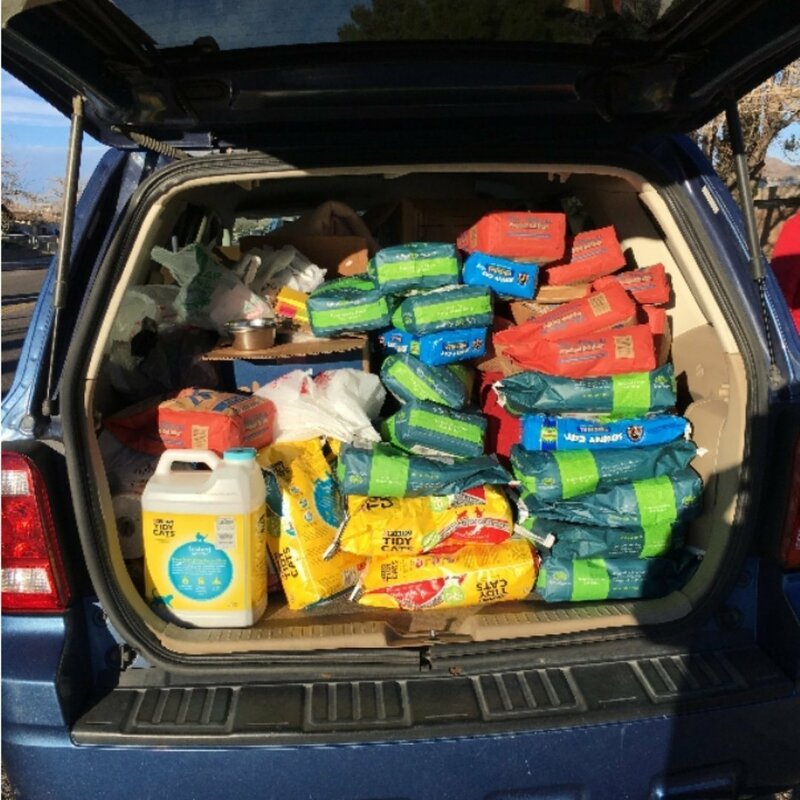 One load of pet food and other supplies delivered to Western Arizona Humane Society courtesy of Kingman Middle School students efforts to help the community. KINGMAN – A deep reach into a pocket, change drawer, car soda holder or between the seats can help the local animal shelter. 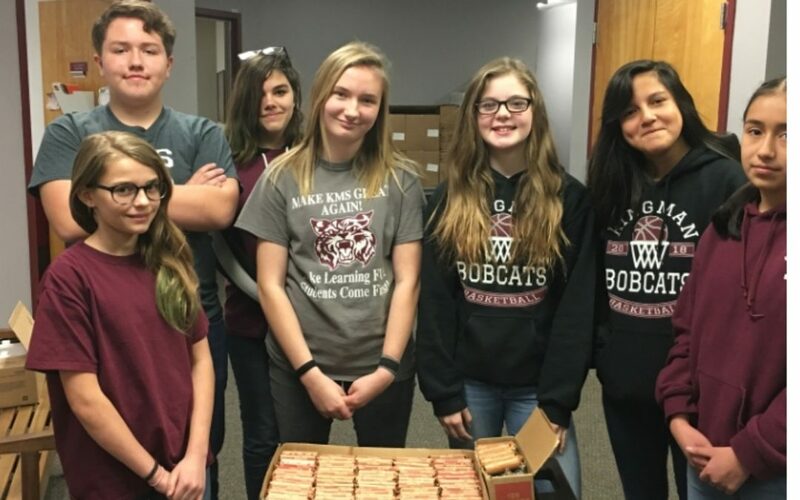 The Kingman Middle School National Junior Honor Society kicked off 2019 with a mission to raise funds for the Western Arizona Humane Society and that war was won with pennies. “Animals don’t really have a voice, so we took it on ourselves help,” said Kingman Middle School Assistant Principal Lisa Nikodym. As the new school year started, roughly 700 KMS students participated in their first ‘Penny War’. The kids started their first period classes by having the option to drop a few coins in a jar. Pennies gained positive points while dimes, nickels, quarters, and dollar bills for negative points. That doesn’t mean the silver money was no good. KMS NJHS Advisor Wallis Alexander led the effort. His wife is an animal lover who’s fostered puppies from WAHS and the couple decided to help the overworked shelter. Nikodym added a twist to the competition. The students got a copy of supplies the shelter needed (blankets, food and cat litter) and placed a point value on the items. The kids could choose to bring money or supplies and the classes competed for points. The official ‘Penny War’ lasted January 14 – 30 and raked in about $400 dollars in cash and at least one car load of supplies during the first week of the contest. If students couldn’t scrounge up coins, blankets were worth 2,000 points ($20 in pennies). By the following Monday (Jan. 21), about 140 blankets had been donated. “If I had to hit my brakes, I could’ve been knocked unconscious by kitty litter,” she said while describing how she’s still cleaning grains of cat litter out of the SUV. The students were still delivering supplies and counting coins Thursday. More than $750 in cash donations (about $190 of which were pennies that took several hours to roll), 150 blankets, 145 bags of cat litter, 98 dog and cat toys, 90 leashes and collars, 12 cans of kitten formula, 16 food bowls; four brooms, three dustpans, 1 litter box, numerous bags of food and office supplies. WAHS Operations Manager Nicole Mantiameli is extremely grateful, especially during the last few chilly winter days. “We’re over capacity and the blankets come in handy when it’s cold out,” she said. She almost had to collect her thoughts after the donations rolled in. Similar charitable projects are in the works. Nikodym is looking to include the entire community, be it other schools or local businesses, to join in. “It would be a competition, which leads to more competition,” she said. Story by AARON RICCA with contributions from Lisa Nikodym. PHOTOS COURTESY OF LISA NIKODYM.